Many people think that the Arabian Peninsula is just desert and more desert but, while there is admittedly a lot of desert, there are also dramatic mountains, wadis and coastlines. Oman, despite being 75% desert, also has 1,700 km of striking coastline and mountains that reach just shy of 3,000m. Jebel Shams, at a peak of 2,996m, is the highest point. Here temperatures are appreciably cooler than the coastal plains and, fleetingly, they get snow every year. 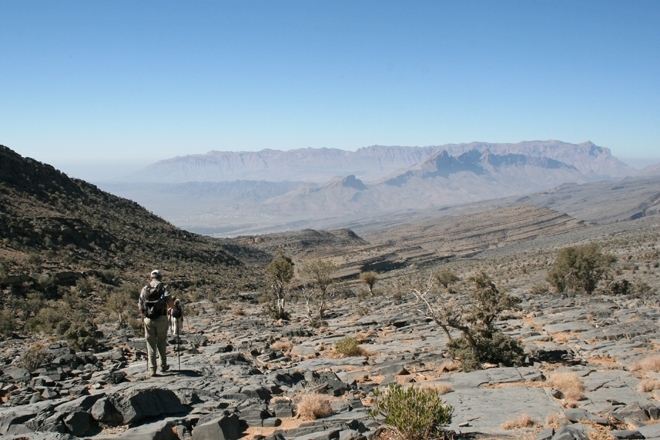 Jebel Shams (Sun Mountain) together with the nearby Jebel Akhdar (Green Mountain) make up the Western Hajar range. The trekking in Oman is not for the faint-hearted; the terrain is rocky and in places unforgiving. It lacks the smooth surfaces of nicely weathered rock that you might find elsewhere and the ascents and descents are steep. This makes it all the more remarkable that the Western Hajar is well populated with villages and towns that were established centuries and sometimes longer ago. The main motivation for living in such rough and steep terrain is the temperatures. Not only is it more tolerable than the 45 degree centigrade summer temperatures of Muscat but it also means that the season for growing crops is longer. Amongst the villages clinging to the precipitous cliffs (where legend has it that children are traditionally tied to their beds at night to make sure they don’t fall), are serene plantations of date trees interspersed with mango, banana and papaya. Grapes are grown and were traditionally used to produce a local wine although I am told this no longer happens, apparently. The wild honey from amongst the wadis is some of the most expensive in the world. Roses are harvested from the tiered fields around May and distilled into rose water. The Mountains & Deserts of Oman trekking holiday with Mountain Kingdoms visits the Al Hajar and Jebel Shams ranges. The trek takes you through spectacular scenery of mountains, gorges and canyons whilst staying in remote camps that give you a real taste of the wild.